← U.S. inflation rises 0.3% in June; what does it mean for TIPS and I Bonds? The US Treasury announced yesterday it will be creating a new 10-year Treasury Inflation-Protected Security at an auction next Thursday – July 23, 2015. This is CUSIP 912828XL9 and the coupon rate and real yield to maturity will be set at auction. I consider the 10-year maturity the ‘sweet spot’ for buy-and-hold TIPS investing, since it fits into most people’s life expectancy (versus the 30-year) and gets a bump in yield (versus the 5-year). The Treasury must agree, since it creates two new 10-year TIPS each year and reopens each twice, for a total of six 9- to 10-year TIPS auctions a year. 912828H45, issued in January) is trading on the secondary market with a real yield to maturity of 0.49%. The Wall Street Journal’s Closing Prices page shows that same TIPS closed yesterday with a yield of 0.479%. The Treasury’s Real Yields page estimates that a full-term 10-year TIPS would have closed yesterday at 0.52%. That number is in line with the Bloomberg and Wall Street Journal numbers, since a full-term TIPS should yield slightly higher. So at this point we’re looking at a 10-year TIPS with a real yield (after inflation) to maturity of around 0.52% and possibly a coupon rate of 0.50%. But a lot can happen in a week, especially with the market volatility we have seen around the world. 5 had a yield of 0.500% or higher, the highest was 0.661% in January 2014. 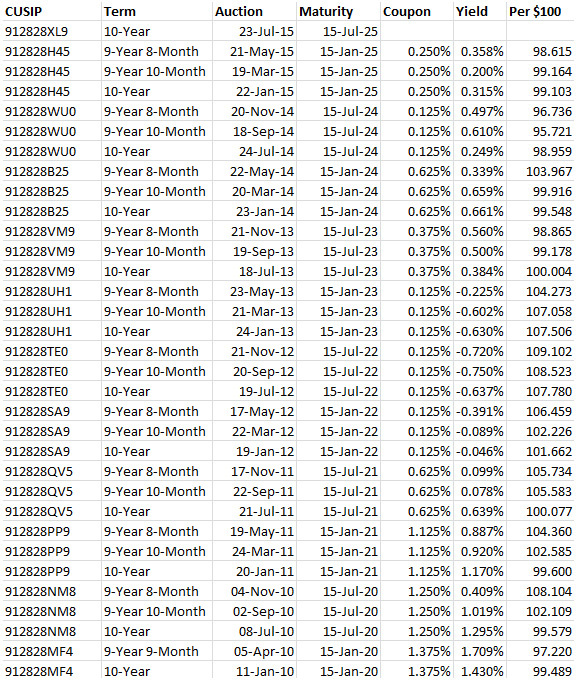 3 had a negative yield, the lowest was -0.630% in January 2013. So this auction is shaping up as ‘upper middle of the recent pack.’ Not exciting, but also not horribly unattractive. The questions. Where do you think interest rates are headed? Do you see the Federal Reserve stepping up later this to raise short-term rates? Even if that happens, do you see the Fed action having much effect on longer-term rates? And will the Fed make just a token move higher will no followup? Will interest rates begin rising in Europe, making US Treasurys less desirable, causing yields to rise? Or will market disruptions cause a flight to safety and send TIPS yields plummeting? My expectation is that yes, the Fed will finally raise short-term rates later this year. It has given that signal multiple times. But unless inflation begins rising dramatically, the Fed move will be token. Rates won’t rise by much. A final thing to remember: This 10-year TIPS will reopen at auction in September and November, giving investors two more shots to jump aboard. At this point, I probably won’t be a buyer, but things might change in the next few days. As usual, two thumbs up. I am sure Wall Street has an inherent bias against the public investing in TIPS & certainly not directly, please. Still their coverage is pathetic compared to your analysis I have to say. For me .50% is on the borderline for TIPS versus 3.0% on an 8 year municipal. bond. Once you retire, you really need to concentrate on preserving your assets relative to inflation. TIPS are about the only “riskless” asset out there than can come close to doing that. Once I turned 60 I started getting interested in TIPS and iBonds. Thanks to the “Great Recession” and the FED’s subsequent intervention in the bond markets, TIPS have experienced events that were only once considered to be theoretically possible. That’s things like negative YTM’s and the deflationary period of the last 12 months. Until the FED normalizes interest rates, I don’t plan on moving any significant amount of money into TIPS. I’ll probably wait until November to see what affect the first FED rate hike has on the bond markets (assuming that it actually happens). As far as municipal bonds go, I’ve avoided them because the interest on these bonds is factored into calculating how much of your Social Security income is considered taxable. Determining how to minimize taxes on Social Security income added around twenty new lines to the spreadsheet that I use to model the tax hit that I’ll be taking in retirement. The end result of that calculation was to put off taking Social Security until 70. By burning some of my retirement funds, it will lower the annual requirement minimum distribution that will kick-in when I turn 70. Since this approach will also raise the annual Social Security benefit, everyone’s break even point on this calculation will be different. In my particular case, waiting until 70 optimized my tax savings (under the current rules). Of course, that’s assuming that I make it to 70! Jimbo, I haven’t retired yet, but have started putting ducks in a row for that event, maybe three years from now. I can see how taxes will be a big issue. Right now, I also plan on holding off on Social Security until 70. At the same time, required minimum distributions also factor in. It’s complicated, but gives me a lot to write about in years ahead.